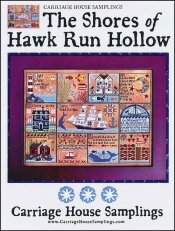 Shores Of Hawk Run Hollow [C6271] - $32.00 : Yarn Tree, Your wholesale source for cross stitch supplies. Cross stitch pattern by Carriage House Samplings. A sampler of eleven blocks with nautical motifs, ships, and underwater scenes. Stitch count 369 wide x 278 high.